Summer has already hit here in Southern California, so it’s time for us to start spending all our days at the beach, and for me to bust out all my summer beauty products! But even those of you who are just only heading into spring, summer isn’t too far away and it’s always good to be on top of your beauty products game so you’re ready for the season ahead! Today I wanted to share six of my favorite summer beauty products. I’ve been using all of these products for a while, and absolutely love each of them. 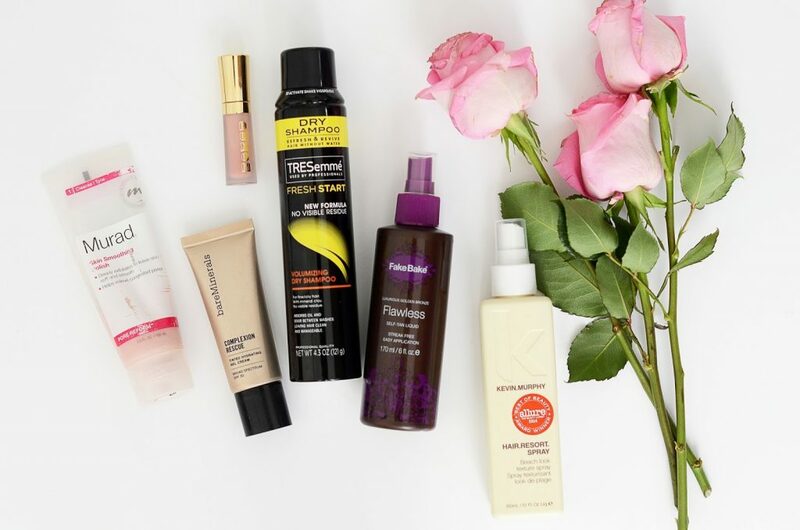 They are honestly six products I will use regularly all summer long, and you should too! 1. murad skin smoothing polish. I’ve been using Murad products for over a year now and love every product from them that I’ve tried. But I think this skin smoothing polish is my very favorite. I’ve tried a ton of exfoliating kinds of products — both face brushes and cleansers — but have never used one that I love as much as this one. The tiny beads inside the cleanser feel almost like a soft sand, and after one little scrub your face is left as soft as baby skin. I use it about twice a week on my face, and it keeps any flakiness away. I love using it right before I head to the beach so I have fresh skin, ready for a little sun kiss! bare minerals complexion rescue. I use clinique liquid foundation as my everyday foundation, but during the summer when I want something super lightweight, but still with some coverage, this complexion rescue foundation from bare minerals has become my go-to. It’s perfect for the beach when you just need a little extra coverage. bare minerals buxom lip polish. Bare Minerals sent me a few of their new lip glosses a few months ago, and among them was the buxom lip polish. It’s a plumping gloss that gives your lips a full look, and combined with the glossiness of it, it makes your lips the center of attention on your face. But fair warning, it’s venom that plumps those lips right up, so it does give you a tingly sensation when you first put it on. I personally like a neutral colored gloss, especially for the warmer summer months when I tend to go more natural with my makeup, so “white russian” and “sophia” are my very favorites. tresemme dry shampoo. I’ve been a big supporter of suave dry shampoo for the past few years. But just last month I went to purchase some and they were temporarily out of Suave, so I picked up a bottle of TreSemme dry shampoo instead. And after using it a few times, I’ve decided I love it even more because it doesn’t leave any residue (suave always left a little bit of gray), it makes my hair feel really clean, and it gives me a little extra volume. And the true test for me is how long it lets me go between washes. So far it’s given me about 3 additional days — last week I went 10 days without washing my hair! For those summer months when I never want to wash my hair, this is the best product. fake bake self tanner. I started using this self tanner before our Hawaii trip and fell in love with it. Spray the tanner out of the bottle onto the “mitt,” and glide the color all over your body. It goes on completely streak-free, and I even use it on my face (although they have a special just-for-face version as well). During the summer months when you’re living in summer skirts and dresses, this will be your best friend. No more pasty white legs! kevin murphy hair resort spray. You know those perfect beachy waves that everyone wants, and very few can actually create? This is my secret weapon for those kinds of gorgeous waves (in fact, I might do a hair tutorial with this product at some point). I love using this product in 3 or 4 day dirty hair (that has a bit of leftover curl) scrunch it up a bit, and then let it create perfectly tousled, beachy waves. It also doesn’t make my hair greasy, or weigh it down. This stuff is seriously magic! Plus, a little goes a long way, so one bottle will last you for ages! Ok, what am I missing? What amazing products could you not live without during the summer?? shop these products with the links above, or click the images below to shop! I’ve been needing a suggestion for new exfoliant scrub. Thanks! You’ll love this one, I’m sure! It’s by far the best exfoliating scrub I’ve ever used! If only I read this a few days earlier! I was looking for a bargain dry shampoo, but purchased a more expensive one instead. I’ll have to keep this one in mind when I run out. I have used and love the Buxom lip polishes for years, but haven’t heard of too many others using them so I was thrilled to see your post. My mom actually got me hooked on them! Sometimes I stray to other polishes or lipsticks but they just aren’t “me” like the Buxom in Trixie. I’m a big fan of Laura Mercier tinted moisturized in summer too. I love that it includes SPF. I just picked up a new dry shampoo after asking for recommendations on Facebook – it is called Batiste ($8 at Ulta, 1100+ reviews and 4 1/2 stars). I’ll have to report back after I’ve used it a few times. I also heard great things about Dove’s dry shampoo. yes, let me know about the Bastiste dry shampoo! I’m so surprised there’s no sunscreen on this list! Granted I’m the palest it gets, so talk of summer must-haves always brings to mind SPF. I’ve never found one that has everything I want in a sunscreen- easy to apply, non-white and non-greasy, easy to travel with, smells normal, etc. If anyone has one they love, let me know! That’s my daily foundation product, actually! I mean like for arms and chest, I turn red after about 20 minutes without it! I am jealous of those who get the “beach waves” when I go to the beach I get poodle puff hair or Shirley temple hair. I have been wanting to try the dry shampoo and never can find it! I understand wanting that sun kissed glow but there is nothing wrong with having “pasty white legs”. Let’s embrace the skin we are given and stop making pale skin a negative. Do you use the dry shampoo every day after your hair wash day? Or would that make it dirtier faster? I’ve tried a lot of dry shampoos and honestly I have to say I am super unimpressed with the TRESemme dry shampoo. It’s a little oily feeling and sometimes made my hair look even greasier (especially bangs) (and for me it only could last a day or two before I HAD TO wash), had practically no grip, and smelled a little like old lady. I much much prefer Not Your Mothers dry shampoo (and if you’re worried about residue, put it in before you go to bed, or at least a few minutes before you style it).